KISSmetrics is a powerful business intelligence platform that lets users determine, monitor, and enhance the metrics and other elements significant to the success of their businesses. With such information turned into actionable insights, KISSmetrics has what it takes to help you create marketing strategies and improve existing marketing practices, but due to its advanced customer tracking & analyzing capacity, you will also get to use it as your advanced conversion rate optimizer. Unlike what you’d expect from a tool combining similar features, KISSmetrics’ pricing is quite flexible, and made accessible even to startups and small businesses. 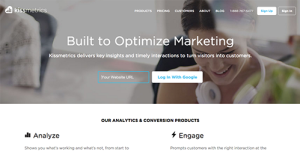 In short, KISSmetrics boasts highly flexible custom data plus an API that is very simple to connect. Experts laud KISSmetrics’ structure as it focuses on people, tracking customer trends and shifts, and providing users with useful interpretations of their business health. Thanks to it, they make smarter business decisions and benefit significantly from market’s opportunities, while simultaneously preserving a solid, professional reputation in the eyes of their clients. Before anything else, KISSmetrics is a system designed for deep data tracking, and probably the one most capable of giving users deep insights on how business is doing. It compares vital metrics and automates updates, so that all users will understand how far they’ve gone working on the company’s goals, and what their customers are genuinely expecting from them. The rule of thumb says the closer you are to your audience, the more people will buy for you, and KISSmetrics proves this is very accurate. With deep tracking, users can get great insights from a customer at the deepest levels, enabling users to understand their customers better, even before they decide to make the purchase. The smartest thing about KISSmetrics is how it remembers and stores information of all customers who have at least once been associated to your services. Be it your most loyal buyer or a randomly referred friend of a friend, once he is in, he is in. From here on, you can only imagine what KISSmetrics does to enhance your lead generation processes, and how good it is at it. Overall, purchasing KISSmetrics means rewarding your business with a people-centered system, where all insights are accurate, deep, and significant. The information you’ll be provided with will be enough to build steady strategies without involving third-party services and applications. Nevertheless, you can still connect KISSmetrics to all applications installed in your software ecosystem. If you are interested in KISSmetrics it might also be a good idea to analyze other subcategories of Best Business Intelligence Software collected in our database of B2B software reviews. Every enterprise has different wants and needs a system that can be personalized for their size, type of workers and clients, and the particular industry they are in. For these reasons, no software can offer perfect functionality off-the-shelf. When you search a software system, first be sure what you require it for. Read some KISSmetrics reviews and ask yourself do you desire basic functionality or do you require complex features? Are there any industry-specific functionalities that you are looking for? Get the answers to these questions to assist your search. There are plenty of elements that you need to reflect on and these include your finances, specific business wants, your organization size, integration needs etc. Take your time, use a few free trials, and finally choose the app that offers all that you want to enhance your firm effectiveness and productivity. How Much Does KISSmetrics Cost? We realize that when you make a decision to buy Business Intelligence Software it’s important not only to see how experts evaluate it in their reviews, but also to find out if the real people and companies that buy it are actually satisfied with the product. That’s why we’ve created our behavior-based Customer Satisfaction Algorithm™ that gathers customer reviews, comments and KISSmetrics reviews across a wide range of social media sites. The data is then presented in an easy to digest form showing how many people had positive and negative experience with KISSmetrics. With that information at hand you should be equipped to make an informed buying decision that you won’t regret. What are KISSmetrics pricing details? What integrations are available for KISSmetrics? Pros: There is so much to like about KISSmetrics, and I think appearance is the most improtant one. The software's interface is so neat and clean, that there is no way to mess up or to get confused. Even so, the support team is attentive to answer all possible questions, and they do it immediately. They provide you with amazing reports which solve almost 90% of all questions, while the rest can be implicitly understood by paying slightly more attention. Being able to draft my own reports and to follow everybody's performance on a single timeline is invaluable for my work, and I rely almost entirely on live tracking. Being as busy as I am, KISSmetrics is absolutely indispensable to me. Cons: I'm mostly concerned about time, it takes me ages to perform certain actions. Some of the pages load too slow, and generatging reports is even impossible. It gets especially annoying when the dropdown menu freezes, and you have to wait to select your event or property. Still, I understand the amount of information the program is dealing with, so I've learnt to work this way, I don't really mind (unless it is the People Search page, that one takes ages for real!). Pros: Kissmetrics offers lot of data and great set of tools and options. I really enjoy working with Kissmetrics solution. Also, you are allowed to combine all the data by using various search levels. Cons: I’m not very impressed of its service, they are hard to contact and get feedback from them. Also, when doing funnel search there is no ability to click on users of specific group. Furthermore, the path tool needs some improvements, it’s not useful for our business. If you need more information about KISSmetrics or you simply have a question let us know what you need and we’ll forward your request directly to the vendor.